Strafford Nordic Center is open daily from 9am-4:30pm for the 2018-19 season. Day pass sales end at 4pm. 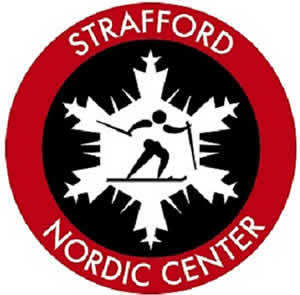 Strafford Nordic Center, located at 53 Rockbottom Rd in Strafford, VT, offers 30KM of groomed Nordic trails for skiers of all ages and abilities, a Biathlon Range, a full service rental department, ski lessons and a cozy ski lodge. Located just 10 minutes off I-89 and 2 1/2 hours from Boston and Hartford CT, we are the most convenient Nordic Ski Area in Vermont. Our 30K trail system is stage one for a planned 50 kilometer trail system being created on two locally owned well known farms. The base lodge and trail head are located at Rockbottom Farm, a working organic dairy farm and home of the Strafford Organic Creamery. Scenic ski trails are hosted on Rockbottom Farm's spacious fields, rolling hills and wooded expanses. Additional trails are hosted on Tamarack Hill Farm, long known for its high level equestrian training, gorgeous scenery and challenging terrain. While enjoying a day of skiing on these two majestic Vermont farms, take in the long range views of Vermont and New Hampshire from the ridge line on the Outer Loop trail. If cruising is more your style, try out the the rolling fields and winding woods trails. Whatever type of skier you are, we have the nearby trails you've been looking for. Trail Fees Trail Pass Type	Single Day	5-day punch pass Adult	$20	$90 Youth (6-17)	$15	$65 Senior (60+)	$15	$65 Child 5 & under	Free w/adult	Free w/adult Family	$60	$220 Fat Bike	$15	$65 Snowshoe	$15	$65 Child 5 & under must be accompanied by paying adult. Family pass is valid for 4 people. Additional family members $10 each. The sun is shining,ctemos are climbing and trails are in amazing shape with tons of snow. Everything is packed powder, some tracks set, more going down for the weekend! what an incredible day to ski!